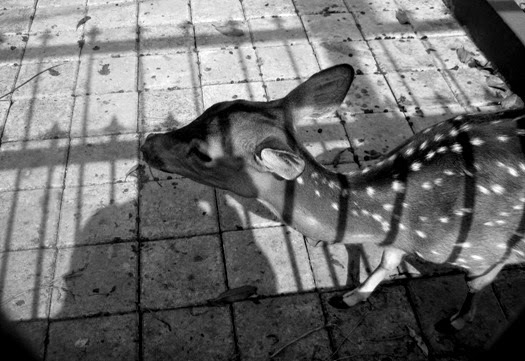 I captured this white-spotted deer from behind the fence that surrounds the Bogor Palace last week. The shadows show it, right? There are many deer live in the Palace front yard, but only some deer dare enough nearing the fence and visitors. Cutie, I like deers, got three in my garden for time to time. Beautiful photos. What a great photographic opportunity. Great shots of the sweet little one. Beautiful bw shot of nature's sweet heart ~ great light and shadows too! Oh, this is wonderful! 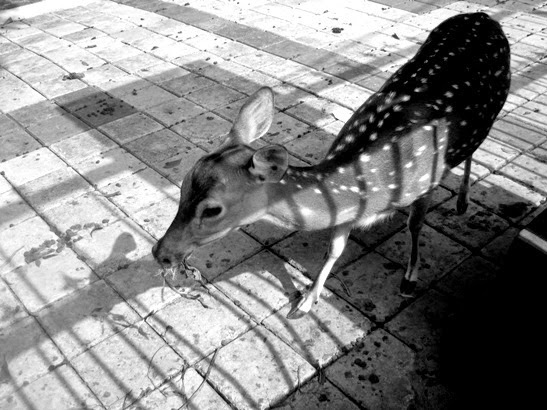 I love the contrast of the straight lines in the shadow and the white dots on the deer.